No time to look in the mirror, making a few adjustments before going on air? 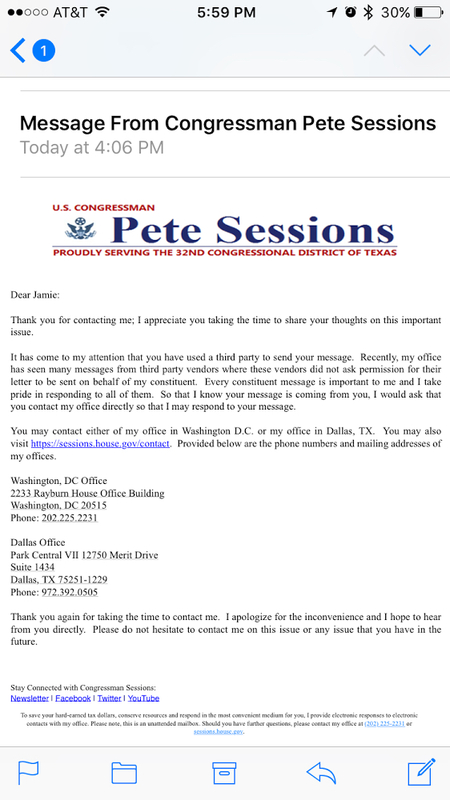 The congressman from District 32 has very strict rules about communicating with his office. Congress has accomplished the amazing feat of making it hard to email them. It’s actually easier (!) to fax. So I started faxing every day. And I wanted to make sure my faxes were getting through, so I started learning about how Congressional offices handle messages. It turns out that most of them use software to help them categorize the inbound messages they get, sort them into issue buckets, and tally up the for/against numbers. Faxes and emails get automatically scanned and dumped into that flow — as long as they are not form letters and are verifiably from a constituent. So I designed Resistbot to solve this problem for me. It makes it insanely easy to generate a fax to each of my representatives every day. It doesn’t tell me what to say (remember, form letters don’t count) but makes my short text into a nice-looking letter. Now, I have my voice heard daily. Thank you for contacting me; I appreciate you taking the time to share your thoughts on this important issue. It has come to my attention that you have used a third party to send your message. Recently, my office has seen many messages from third party vendors where these vendors did not ask permission for their letter to be sent on behalf of my constituent. Every constituent is important to me and I take pride in responding to all of them. So that I know your message is coming from you, I would ask that you contact my office directly so that I may respond to your message. One the one hand, if Sessions is getting spammed by fax bots, I understand his effort to stanch the flow. But that’s not how Resistbot works. And, anyway, isn’t the the U.S. Postal Service a third party vendor?